As a special pulsing star passes through the particles streaming from its companion, it emits high-energy gamma rays. Astronomers have discovered a rare binary star system by following its powerful gamma-ray signal — a find that may remove the element of luck from locating more its kind, a new study reveals. Unlike other gamma-ray twin star systems found by chance, a direct search for gamma rays revealed the newfound binary system 1FGL J1018.6-5856 about 15,000 light-years away. The method may be a new tool to identify more of these hard-to-find stellar pairs, researchers said. High-energy gamma rays are challenging to locate because so few of the photons streaming from the system make it to Earth. 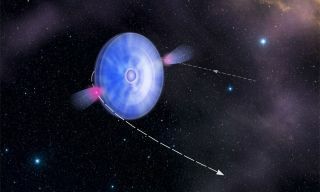 "Even if the system is giving out as much energy in gamma rays as in optical light, we still don't get many photons coming in the gamma-ray regime," study co-author Robin Corbet told SPACE.com. Only a few photons per day reach Earth, making them difficult to spot. Those that do are absorbed by the planet's atmosphere, making them impossible to see from the ground. Instead, an international collaboration of astronomers used the Large Area Telescope on NASA’s Fermi Gamma-ray Space Telescope. Launched in 2008, the telescope sweeps the sky over several hours, making it ideal to search for objects whose gamma-ray brightness varies regularly. The small handful of gamma-ray binaries that have already been discovered were found serendipitously, Corbet explained. They looked strange in the radio spectrum, or perhaps in the X-ray. Follow-up with these sources led to the discovery of their gamma-ray emissions, and their identity as gamma-ray binaries. Not so with 1FGL J1018.6-5856. "In this case, we started off with a gamma-ray source," Corbet said. The research will appear in tomorrow's (Jan 13) edition of the journal Science. Gamma-ray binary star systems come in two flavors, and identifying which an object presents is its own challenge. Some are born of microquasars — neutron stars or black holes the size of the sun pilfering material from a massive companion star, with fast jets shooting from the top and bottom. The system 1FGL J1018.6-5856, however, is thought to be a special pulsating type of neutron star, interacting with the stellar wind of its companion. The two circle one another about every 17 days. Small, dense neutron stars are born when a massive star dies in a violent supernova explosion. The city-size star emerges with a rapid spin, and gives off gamma rays, according to current models. But for 1FGL J1018.6-5856, the steady flashes of light that generally come with a pulsar aren’t visible. Corbet blames the dense wind from the O-type companion. "These stars are much hotter, ergo more massive, than the sun," he said. Charged particles blowing from the sun create amazing auroral displays as they interact with Earth’s magnetic field. Corbet describes this solar wind as "wimpy" in comparison with the one blowing in 1FGL J1018.6-5856, which cloaks the strobe-light effect pulsars are known for. "The wind is basically hiding the pulsar emission," he said. Gamma-ray binaries are a rare breed. Only four others are known, Corbet said. But astronomers believe the systems that contain a quick-spinning pulsar eventually become relatively slow-spinning X-ray binary stars, which are far more plentiful. Over time, the rapidly rotating pulsar slows. "It spins down with time, and turns into an X-ray binary," Corbet said. "The suspicion is, before you have an X-ray binary, you have a gamma-ray binary formed." Only X-rays binaries with young, hot massive stars are thought to be birthed from the gamma-ray binary star systems. Corbet hopes that an ongoing, consistent search with Fermi will turn up other gamma-ray binaries that have gone undetected, leading to a greater understanding of how they evolved. If nothing else, it is a more direct way of searching that doesn’t rely on luck to reveal these rare stellar pairs. "We’re really hoping that this is the tip of the iceberg," Corbet said in a statement. "We've got our fingers crossed that as Fermi continues its mission for more years and our measurements get more and more sensitive, we'll find even more binaries."